This post will be slightly different to all of our other posts here on VivaLaVidaFM in that it will be mainly based on images rather than text. 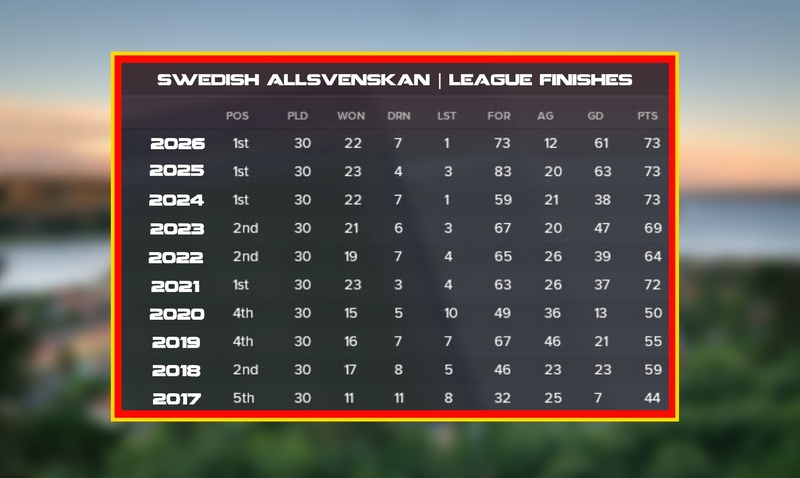 As this is the 10-year review of my save with Ostersund, I have already written about what has happened in each season. This post I will be reviewing our ten years in Sweden with graphics. I hope you enjoy! Oscar Friberg joined Ostersund midway through the 2017 season. He led his new side to a 5th place finish and followed this up with a hugely impressive 2nd place finish the year after. 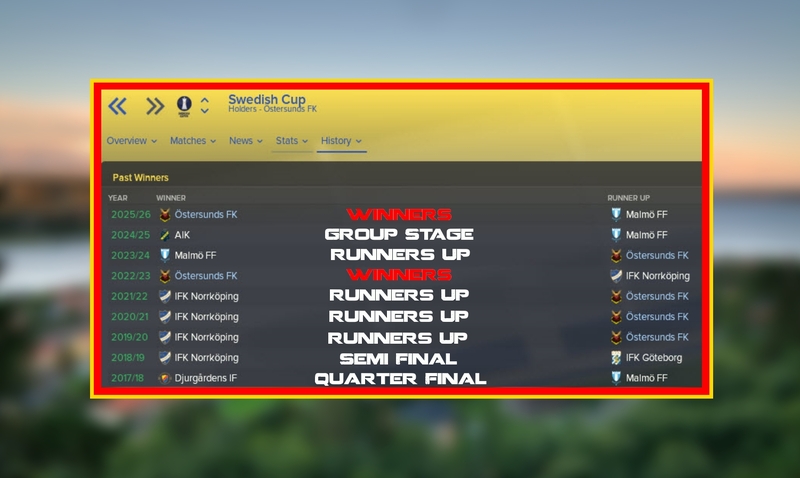 Two consecutive 4th place finishes followed before Friberg and Ostersund’s maiden league title in 2021. It would be two seasons before Ostersund would win the league again, but as we reach the 10th season Ostersund have now won the league 4 times. 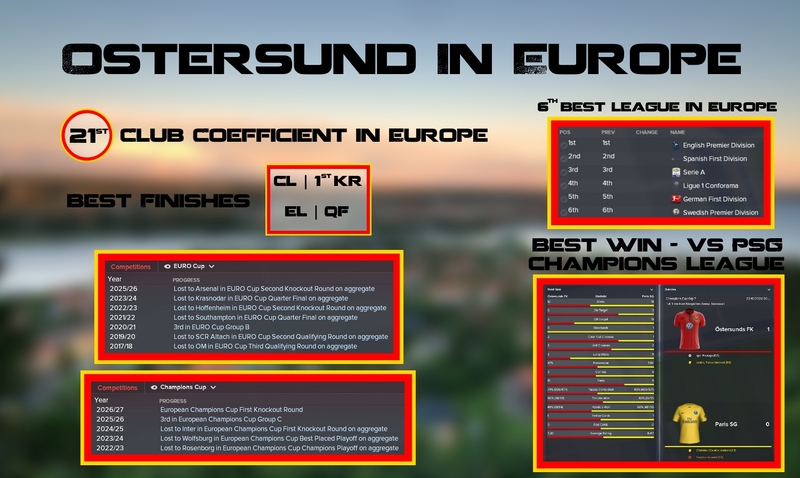 Ostersund rose to prominence in the real world as a result of their Europa League exploits in the 2017-18 season, reaching the 1st Knockout Round where they lost to Arsenal. This came off the back of their first Swedish Cup win in 2017. Since then, Ostersund have won two more Cups. Yet I’m sure that Friberg will be slightly disappointed with this number, they finished runners-up on four occasions. One of the most significant factors behind Ostersund’s dominance in Swedish football has been their consistent performances in Europe. Ostersund are now ranked as the 21st best club in Europe in the coefficients table, just one place behind Juventus and ahead of teams like Dortmund, Sevilla and Napoli. I think this GIF demonstrates clearly the progress we have made as a club. When we joined, Ostersund were valued at £5.53M. Now, ten seasons on, Ostersund are worth nearly 50x as much at £243M. You can see how vastly our facilities have improved too as we now have excellent training facilities and superb youth facilities. 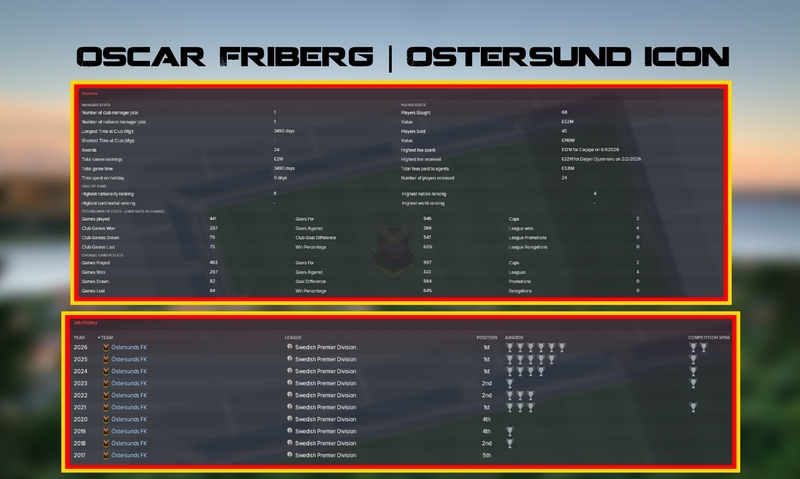 Oscar Friberg has become an iconic figure in Ostersund history and is on his way to becoming a legend of the club. The Swedish manager has shown no indications to move on from his first managerial role and is surely chasing European success with Ostersund. 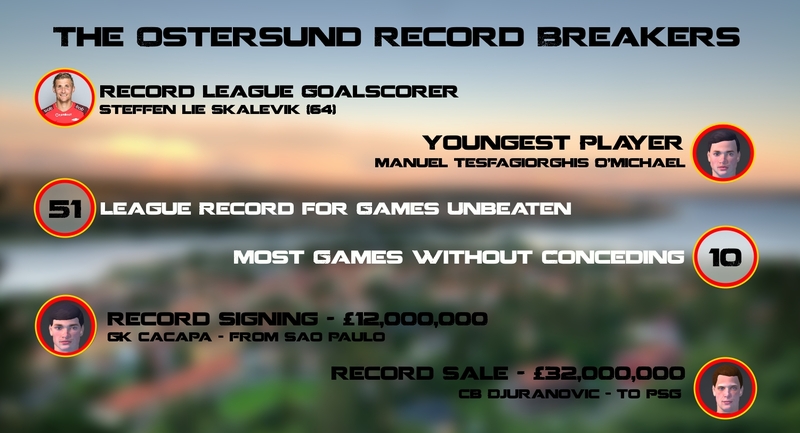 In the most recent Ostersund season, we broke an Allsvenskan record that had stood since 1950. We went 51 games unbeaten, breaking the record set by Malmo. We have also begun to revolutionise the transfer market in Sweden, constantly breaking transfer spending records. Gabriel Gudmundsson has become our top appearance maker in the save so far with 261 appearances. He also holds the assist record with 91. Rhian Brewster is our top scorer, having netted 108 goals in his 154 games. If you wanted to catch up on any of the series so far, here is a list of the previous posts in order. 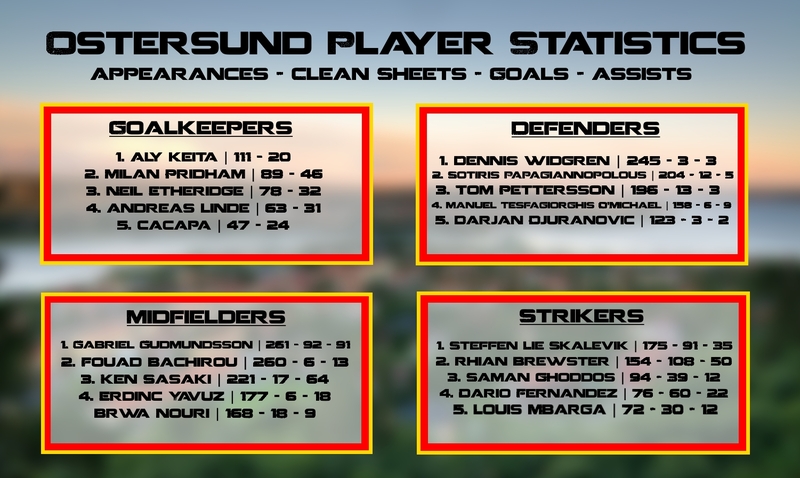 Hopefully you enjoyed this review of our ten seasons with Ostersund and, as always, thank you very much for reading!